Lab test results help us pin point causes behind your pet's symptoms quickly. Test results lead us to accurate treatment sooner, helping your pet feel better. Results help diagnose issues today and serve as a baseline for future trend analysis. Think of test results like the gauges on your car's dashboard, helping understand key indicators of well being. Typically, Advanced Care provides results while you wait. Many diagnostics and lab tests are done on-site. With results in hand, we help you evaluate treatment options. Accurate Blood Analysis While You Wait! Like humans, as pets age they are prone to similar diseases including: diabetes, kidney and liver disease, heart disease, cancer, hypo thyroid (low thyroid hormone level) and hyperthyroid (high thyroid hormone level). Comprehensive blood tests are included with Advanced Care Pet Hospital surgeries. Results are stored with your pet's health record, serving as reference future exams. Blood Cell Counts evaluate the number and type of blood cells in circulation. White blood cells, red blood cells, and platelets are evaluated. White Blood Cells Help measure immune system function. Elevated levels can indicate infection, leukemia, stress, and inflammation. Normal base line levels are important, helping determine changes over time. Elevations in levels, even without visible signs or symptoms, help doctors treat pets more effectively. Red Blood Cells Carry oxygen to the body and remove carbon dioxide to be exhaled. Anemia results when red blood cells low. Platelets Help blood clotting, low numbers can indicate a bleeding issues. The hematocrit (HCT) helps measure the relative number of red blood cells in circulation. 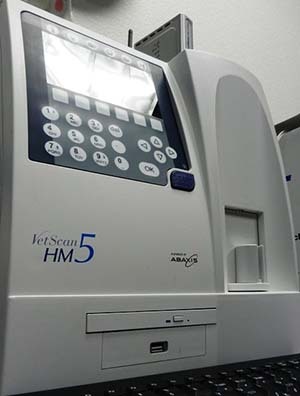 It is used to diagnose anemia and dehydration. Alanine Aminotransferase (ALT) Increased enzyme levels are associated with liver damage or disease. Albumin (ALB) Most important protein in the body, low levels may indicate: chronic liver or kidney disease, intestinal disease, or intestinal parasites (hookworm). Alkaline Phosphatase (ALP) Elevated levels can indicate liver swelling or decreased bile flow caused by liver disease or endocrine disorders such as thyroid disease, diabetes, Cushing's disease or Addison's Disease. It may also be an indicator of certain bone disease. Amylase (AMY) This enzyme is produced to help digest food. Elevated levels can indicate pancreatic and / or kidney disease. Blood Urea Nitrogen (BUN) Reflects kidney and liver disease as well as dehydration. Cholesterol (CHOL) Elevated levels are seen in many disorders including hypothyroidism in dogs, liver and kidney disease. Creatinine (CRE) An important value to monitor kidney function. Glucose (GLU) High levels can indicate diabetes. Low levels can indicate liver disease, infection or certain tumors. Total Bilirubin (TBIL) Bilirubin levels help diagnosing anemia and bile duct problems. Total Protein (TP) Levels help detect liver, kidney, gastrointestinal diseases as well as dehydration. Calcium (Ca) Imbalanced calcium levels are indicative of certain metabolic diseases such as the parathyroid gland, kidney disease and certain cancers. Phosphorus (PHOS) Important to monitor for kidney disease as well as its balance with calcium to monitor numerous conditions. Electrolytes: Potassium, Chloride & Sodium Vomiting, dehydration, diarrhea and metabolic disease can affect these levels.